Poor Facilities for Turtles Must be Ended! The weather is so hot: 34 degrees Celsius . Joko Guntoro (principal officer) and Djoko Priyadi (a volunteer) – go to visit the Crocodile Garden in Asam Kumbang, Medan City, North Sumatera, Indonesia. This garden is well known amongst locals as a place for watching crocodiles. We were watching a collection of animals in the garden : dogs, snakes, monkeys. Surprised: we see the tortoises. As much as seven individuals of mountain tortoise (manouria emys) and one of cuora amboinensis live here in poor facility and condition. 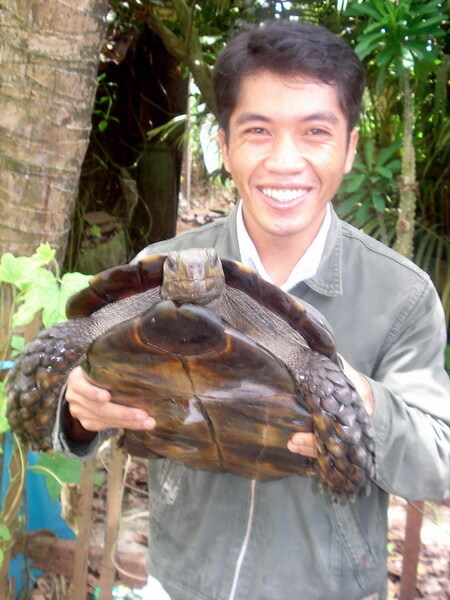 We can say that there are no turtle facilities provided to support their lives in the Crocodyle Garden. We are unable to mark, ID and collect basic data due to fact that the keeper will not give permission. We are only permitted to take a picture and holding of both of the species. After taking a picture of both species, we discussed with the owner about the poor facilities. She said she purchased them from a man in Aceh few years ago. Approximately 5 years ago. 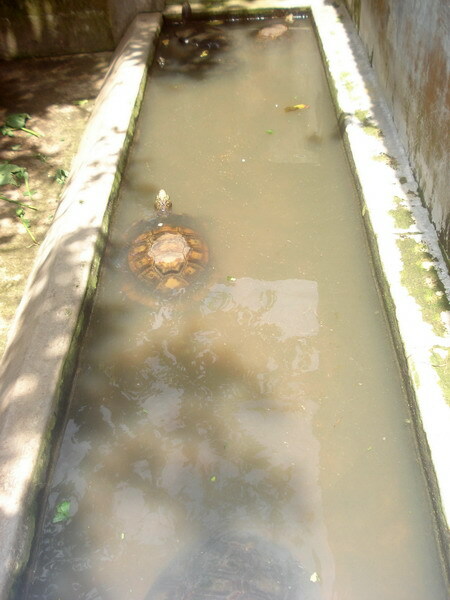 The Crocodile Garden did not have available resources to feed the turtles and providing them with a good facility. After hearing this we are trying to purchase the tortoise and release them to their original habitat. But, the owner rejects this offer. The negotiation failed. The Indonesia Reguluation (PP Number 7 Year 1997) which not listing the manouria emys and cuora amboinensis as protected species makes our effort has more of a challenge. Even the manouria emys is listed as an endangered species according IUCN Red List 2009. In order to save these turtles and give a better condition, we plan to invite the forestry officer to visit this Crocodile Garden. The Forsetry Office is a legal institution who can give punishment to the owner due to the bad facilities to the turtles.